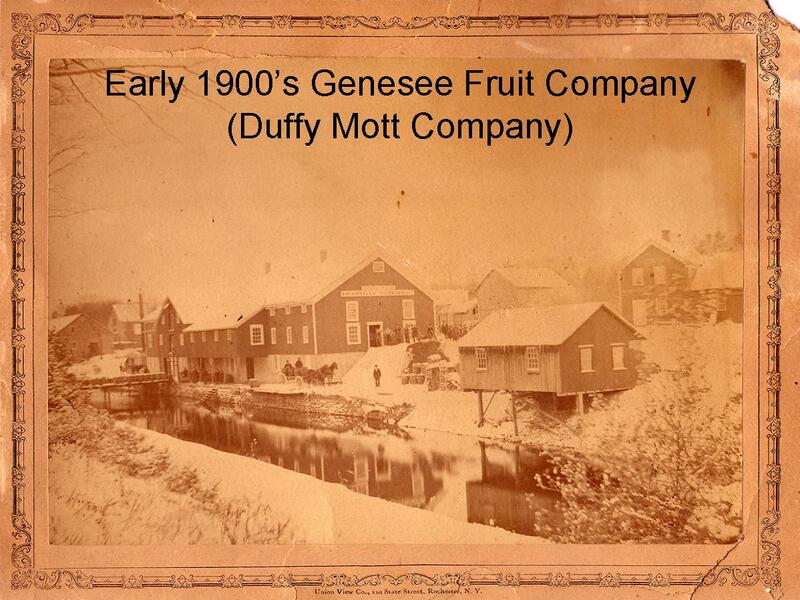 Mott's® apple products was founded in Bouckville, NY on the Chenango Canal. New York at that time was, and today remains a prime apple growing region. 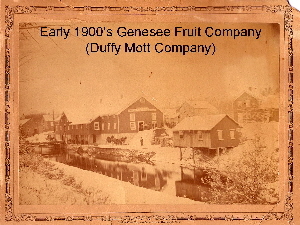 The company was founded in 1842 by Samuel R. Mott in Bouckville, New York, where he made cider with the help of hitched horses that plodded in a circle, crushing apples between two large stone mill stones at the center of the 'sweep'. The crushed apples were shoveled into a crib with slatted sides, packed in straw and pressed by three men leaning on a lengthy lever that operated a jack screw. The golden juice ran off into a tank beneath and was ready for bottling. Mott was very successful in Bouckville. 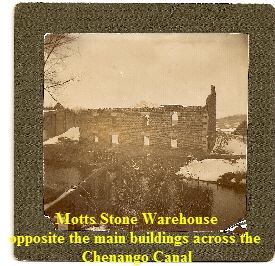 The warehouse was located across the Chenango Canal from a bottling plant that still operates today as the Bouckville Feed Mill, the longest-running feed mill in NYS. Mott originally made apple cider vinegar here. It was known as the bottling plant before the larger complex was built up the street on State Route 20, but destroyed by another fire. S.R. Mott became the Railroad Commissioner and was instrumental in getting the railroad to cross his property on Route 20, next to his business. Across the street, he lived in a house that is still standing today. Mott's cider and vinegar caught the fancy of his neighbors and, as demand grew, so did the size of his mill. Water power and steam replaced his horse and now, with a son to help him, he began enjoying distribution far beyond the local market. Long before the turn of the century, Clipper ships were carrying 1,000 case lots of Mott's champagne cider and casks of Mott's vinegar around Cape Horn to California. most of the above text are from Motts web site, added to by local historian Diane van Slyke.